When I started this blog, I promised some autobiographical accounts, not that anyone is waiting with baited breath for them. True to my word, though, I will oblige. I just revised one of my first blog posts, One of My First Light Bulb Moments. In that post, I recounted some early revelations about the Bible that marked my spiritual journey while I was still an unbeliever. I recalled my observation of the intricate harmony of the Bible and acknowledgement that the Creator of the world could communicate to us if He desired to, and He could also protect that communication if He wanted to. I had these thoughts as I read the Bible for the first time in college. There were other thoughts too. The additional thoughts were not as philosophical; they were much more personal and uncomfortable. In fact, reading the Bible made me feel uncomfortable. It was sharp. It seemed to expose my heart. It seemed to suggest I was at enmity to God. I virtually squirmed as I read it. Though I read the Bible as part of an academic class on world religions, I approached each world religion as part of my own journey for truth. Not just the world religions class, I approached every class in college as part of my truth journey. I was eager to delve into the meaning of life. I was very much a product of 1960’s and 1970’s culture in that respect. There it was: staring me in the face was an explanation for why I felt so uncomfortable. I at once desired to put the Bible down and leave it alone and to press further like a person exploring a cave in the dark with trepidation. God seemed unapproachable to me, and the conviction I felt was painful; yet I could see there was something there. The Bible, unlike most religious texts, is unique in confronting the sinful, imperfect nature of man in all of the pride, selfishness and pettiness that we so clearly see in other people, of course, but are much less likely to see in ourselves. The Bible uniquely reflects that pride, selfishness and pettiness back at us. It forces us to be honest with ourselves. It was many months before I learned a lesson that changed my life forever. If we do not turn from the conviction, but allow it to have its way with us, God’s Word brings us to the cross. At the cross we see God, intentionally divested of His glory, dying as a sacrifice for us, redeeming us from the sin that is in us. We are not left to be perpetually convicted of our sins; we are shown the way out of our condition that God provides. When we confess our sins and believe, we find the glorious truth of salvation, forgiveness of sin and relationship with our God and Creator. We must first see ourselves for who we are, as difficult and uncomfortable as that can be. The Living Word does that: it exposes the sin, but it also shows the way to mercy and forgiveness. 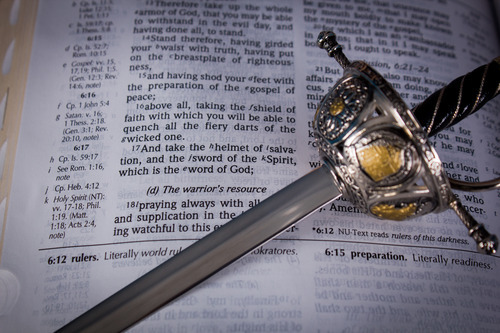 It is sharper than any two-edged sword. The painful exposure of the sin that resides in us gives way to the healing that we desperately need by the same Word that smites us. This entry was posted on May 4, 2015 at 3:40 am and is filed under Bible. You can subscribe via RSS 2.0 feed to this post's comments.